Marjoram essential oil has long been used as a traditional medicine. According to Greek mythology, Aphrodite, goddess of love, once used it as a love potion. Today, the sweet marjoram oil uses and potential healing properties are shared worldwide in commercial products like soaps, shampoos, and creams. Marjoram oil is extracted from the leaves of the perennial plant, Origanum majorana, and is used to treat various ailments orally, topically, and via inhalation. What is marjoram essential oil used for health-wise? Its primary use is for calming nerves. It also may be used for promoting good blood circulation, lowering blood pressure, alleviating pain, reducing inflammation, and settling digestive problems. The chemical composition of marjoram essential oil includes the powerful terpinolene, a-terpinene, y-terpinene, terpinen-4-o1, linalyl acetate, p-cymene, sabinene, cis-sabinene hydrate, and linalool. As an analgesic, marjoram essential oil works to alleviate pain caused by inflammation, muscle fatigue, colds and flu, fever, headaches, and toothaches. The oil does not have the same adverse effects as commercial painkillers. Use it to relieve pain by adding it to your favorite skin lotion or diffuse in a vaporizer. The antispasmodic component of marjoram essential oil targets muscle spasms and spasms of the intestinal and respiratory systems. The oil may help reduce or at least control the activity of the spasm. This is key in health conditions with uncontrollable spasms, including convulsions, spasmodic cholera, and cramps. Marjoram essential oil may be used to fight and prevent fungal infections with its antifungal properties. It works to stop the growth of fungus while treating the invader at the same time. Marjoram oil may help with various skin diseases and dysentery, which is a form of gastroenteritis resulting in bloody diarrhea. The antiviral properties of marjoram essential oil may treat viral infections and the resulting disorders. It may also prevent the related ailments, which include colds and flu, measles, chicken pox, and mumps. With its antiseptic components, marjoram essential oil can be used for both internal and external wounds and sores. It can be used with a carrier oil or added to lotion for direct contact on skin wounds. The oil is intended to treat and prevent wounds from infection such as sepsis, which is the body’s negative response to fighting the infection. Marjoram oil may also prevent the development of tetanus, a bacterial disease that attacks the nervous system. Marjoram essential oil may offer bactericidal treatment for bacterial infections throughout the body. This may include bacteria in the digestive system, colon, urinary tract, and on the skin surface. The oil may be used for colic, food poisoning, malaria, and typhoid conditions. As an active anaphrodisiac, marjoram essential oil could possibly lower testosterone levels and reduce or control sexual desires. This may be helpful to those experiencing sexual impulses of a higher than normal level. Marjoram seeds have been used for centuries for their essential oils to treat digestive problems. The oil is thought to promote healthy digestion by supporting the workings of the stomach acids, gastric juices and bile. At the same time, the aroma of the oil affects the essential salivary glands by triggering them to produce saliva, which helps in the breakdown of food. During the last stages of digestion, marjoram essential oil properties stimulate the contraction and relaxation of the muscles of the intestines for waste elimination. Within the digestive system, stomach issues such as gastroesophageal reflux disorder (GERD), irritable bowel syndrome (IBS), and ulcers can arise. As a stomachic, marjoram essential oil may promote bile production to neutralize excess acid that causes ulcers. It may promote the digestive gastric juices to aid in the breakdown of food as well. The carminative and antispasmodic properties of marjoram essential oil may help the digestive system effects of excess gas or gas build-up. The abdomen muscles spasm, causing the aches and pains, nausea, and vomiting seen with gas problems. These, as well as indigestion, may be treated as the components of the oil could settle the contracting muscles. As a result of some digestive problems, constipation may develop, causing painful abdominal cramps and back pains. Marjoram essential oil may be used as a laxative, since it relaxes the muscles of the digestive tract and large intestine. Marjoram essential oil could be used to regulate and boost the cardiovascular and circulatory systems. It may stimulate the parasympathetic nervous system, known as your rest and digest reaction, while hindering the sympathetic nervous system that triggers the fight-or-flight response. These actions are crucial to good cardiovascular health, as the parasympathetic nervous system stabilizes the body after a state of imbalance brought on by the sympathetic nervous system. Marjoram oil may help to lessen this stress on the heart by improving blood circulation and reducing blood pressure. Marjoram essential oil is rich in antioxidants. It may work as a vasodilator by opening the blood vessels to allow for better blood flow. By dilating the blood vessels, the risk of having a heart attack decreases. A heart attack occurs when the heart does not receive sufficient oxygen due to a blockage of blood flow. Brain hemorrhaging may also be prevented with the use of marjoram oil, because it can work to relax the muscles within the walls of the blood vessels. Cardiovascular disease is also caused by the narrowing and hardening of the arteries, which disperse oxygenated blood from the heart to the rest of the body. This is caused by plaque build-up within the vessels, and is known as atherosclerosis. By easing the blood flow through stimulating the dilation of blood vessels, marjoram essential oil may help to lower high blood pressure. High blood pressure can lead to cardiovascular disease, heart attack, and stroke. The use of marjoram and other essential oils was evaluated in a recent study of a group of middle-aged women with high blood pressure, also called hypertension. Published in the Evidence-Based Complementary and Alternative Medicine Journal, the results showed a significant reduction in blood pressure levels with the implementation of aroma therapy use of the oils. Marjoram essential oil may help to improve the functioning of the brain, as it is thought to keep the mind focused and sharp. The inhalation of the aroma of the oil is used to in efforts to slow down or prevent cognitive degenerative disorders. These may include dementia-related disorders such as Alzheimer’s disease. With its ability to improve blood circulation, marjoram essential oil may alleviate the pain from rheumatoid arthritis affecting the blood vessels. The oil offers a warming sensation to the cells, promoting blood flow. As a diaphoretic, marjoram essential oil stimulates perspiration to remove excess water, toxins, and sodium salts within the body. This may help with lowering fevers and shedding excess pounds. Less toxins lead to a healthy life. Marjoram essential oil may offer diuretic properties by increasing urine production. This not only removes body toxins, but it also eliminates uric acid and bile salts. An increase in the quality of urine output helps to keep the kidneys in good working order, as well as reduces high blood pressure. It is important to remember to replenish lost fluids from excess urine production by consuming more water to prevent dehydration. With its antispasmodic components, marjoram essential oil may address premenstrual, menstruation, and menopausal symptoms of abdominal cramping and headaches. The oil has been used for decades as a cycle regulator by naturally balancing hormones. An imbalance of the androgen hormones can cause polycystic ovarian syndrome, which can be linked to acne, increased body hair, abnormal menstrual cycles, diabetes, and infertility. Marjoram essential oil may reduce high androgen levels. In a recent study published by the British Dietetic Association, in the Journal of Human Nutrition and Dietetics, use of the oil as a tea not only showed reduced androgen levels, but it also improved insulin sensitivity. In addition, marjoram essential oil may stimulate milk production in nursing mothers and promote menstrual flow in women experiencing issues. Male infertility is commonly caused by problems with sperm cells, such as production or transportation for fertilization. These can be directly linked to health conditions like obesity. Marjoram essential oil was used with sage oil in a study published in the Egyptian Journal of Basic and Applied Sciences in correlation with hormone imbalance, obesity, and male infertility. The results showed a positive improvement in sperm count and elevated androgens, reduced testicular lipid accumulation, and an overall increase in testicular structure. Inhalation of the marjoram essential oil aroma may produce a calming and sedative effect, both mentally and physically. This relates to stress, anxiety, mood swings, and tension. Whether it has been a stressful day or trauma-related anxiety, the use of the oil may alter the state of mind to one of relaxation and peace. The antibacterial properties of marjoram essential oil may help to prevent bacterial infections throughout the body, including the digestive system, colon, urinary tract, and skin surface. These pathogens are seen with colic, malaria, typhoid, and even food poisoning. Marjoram essential oil, along with other oils, was used in a Foodborne Pathogens and Disease Journal published study of its effects on five different bacterial strains found in meat. The results showed no new developments of the strains with use of these oils. Along with the sedative properties, sweet marjoram essential oil may aid in sleep disorders such as insomnia and sleep apnea. The oil could also help with asthma issues by improving the voluntary breathing. Furthermore, marjoram essential oil may help with the sleepless nights caused by chronic pain, as it promotes sleep and alleviates pain. Blend: Combine marjoram essential oil with other oils such as cypress, cedar wood, tea tree, bergamot, eucalyptus, and chamomile. Diffuse: Whether on its own or combined with another essential oil, marjoram can be safely inhaled when placed in a room diffuser. This may help with respiratory issues. Bathe: Combine four to eight drops of marjoram essential oil with one teaspoon of a carrier oil such as coconut oil to a bath. A 15-miniute treatment can relieve achy muscles. Massage: Use 10 drops of marjoram essential oil mixed with a carrier oil to apply directly on the skin surface of aches and pains. Coconut oil is a great carrier oil for aching muscles, as it does not oxidize and is light in texture. Massage one to two drops on the reflex points of the feet daily to promote good cardiovascular health. Compress: Add two drops of marjoram essential oil to a hot compress to relieve cramps. In a small bowl of milk, add all of the essential oils and stir well. Add mixture to a warm bath and soak until water becomes cool. In a small bowl of milk, add all of the essential oils and stir well. Add mixture to a warm bath and soak until water becomes cool. Repeat until cramping is alleviated. In a small bowl of the jojoba oil, add the essential oils and stir well. Apply to abdomen using fingertips to massage onto skin. As with the use of any essential oil, it is important to understand any possible side effects that can be experienced. Always perform a skin test by placing the oil alone, or infused with a carrier oil, on a small patch of skin to check for allergic or hypersensitive reactions. Use only in food with young children, as more research is needed to determine if it is safe to use medicinally in children. Marjoram is recommended as likely to be safe for consumption in food and possibly safe as an oral medication for most adults. As it is an emmenagogue, marjoram could stimulate bleeding during pregnancy, and is not recommended for use by pregnant women or those trying to conceive. Nursing mothers should also avoid using marjoram for medicinal purposes, since there is insufficient research on safety. Marjoram is not intended for long-term medicinal use as evidence shows an increase in cancer cases with prolonged use. Additionally, several health conditions may be aggravated with the use of marjoram and precautions must be taken. Hemophilia: Those with bleeding disorders such as hemophilia may experience increased bleeding and a reduction in the clotting ability of the blood. Bradycardia: A slow heart rate and the use of marjoram may be life-threatening, as the oil can reduce the heart rate even further. Plant Allergies: Sensitivity or allergy to any member of the Lamiaceae plant family, such as lavender, mint, oregano, sage, or basil, may worsen symptoms with use of marjoram. Diabetes: Marjoram may lower blood pressure, which could have an adverse effect on diabetics. Blood sugar levels should be closely monitored to avoid hypoglycemia. Digestive Tract: A gastrointestinal tract blockage may worsen with the use of marjoram, as it may cause intestinal congestion. Urinary Tract: Any obstruction within the urinary tract may become worse with use of marjoram as it may promote excess secretions. Ulcers: Marjoram can increase the level of gastric juices in the stomach, which will irritate and worsen any existing ulcers. Lung Conditions: While marjoram may help regulate breathing patterns of those with asthma and emphysema, the herb can also promote excess fluid production, which worsens lung conditions. Surgery: As there is a high risk of bleeding during and after most surgical procedures, it is advised to avoid use of marjoram two weeks before a surgical appointment. Marjoram essential oil has been extracted from the plant since ancient times to treat and prevent health conditions, diseases, and disorders. The sweet aromatic oil has medicinal properties to target pain, inflammation, anxiety, poor circulation, infections, digestive issues, and insomnia, just to mention a few. The oil can offer health benefits when used appropriately and in proper amounts. The marjoram properties may intensify any internal conditions such as bleeding, blockage, and excess harmful secretions. Precaution is recommended with certain existing health conditions. Marjoram may be safe to use in food consumption. “Used for Thousands of Years, Sweet Marjoram Oil Offers Many Benefits,” Mercola, April 6, 2017; http://articles.mercola.com/herbal-oils/sweet-marjoram-oil.aspx, last accessed August 23, 2017. 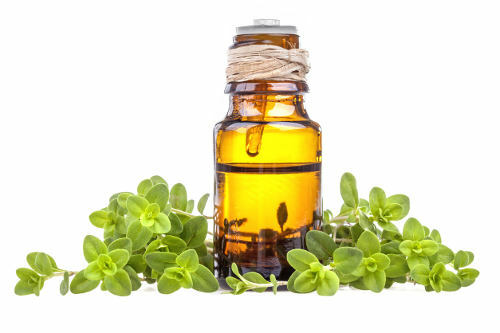 “23 Surprising Benefits Of Marjoram Essential Oil,” Organic Facts; https://www.organicfacts.net/health-benefits/essential-oils/health-benefits-of-marjoram-essential-oil.html, last accessed August 23, 2017. Deckard, A., “16 Benefits of Marjoram Essential Oil,” Healthy Focus, April 28, 2016; https://healthyfocus.org/benefits-marjoram-essential-oil/, last accessed August 23, 2017. “Marjoram Essential Oil: Uses, Benefits and Precautions,” Sustainable Baby Steps; http://www.sustainablebabysteps.com/marjoram-essential-oil.html, last accessed August 23, 2017. El-Wakf, A., et al., “Preventing male infertility by marjoram and sage essential oils through modulating testicular lipid accumulation and androgens biosynthesis disruption in a rat model of dietary obesity,” Egyptian Journal of Basic and Applied Sciences, September 2015, 2(3): 167-175; http://www.sciencedirect.com/science/article/pii/S2314808X15000378?via%3Dihub, ( https://doi.org/10.1016/j.ejbas.2015.05.005 ), last accessed August 23, 2017. Nunes Barbosa, L., “Essential Oils Against Foodborne Pathogens and Spoilage Bacteria in Minced Meat,” Foodborne Pathogens and Disease Journal, July 2009, 6(6): 175-178; https://www.ncbi.nlm.nih.gov/pmc/articles/PMC3145167/, ( https://dx.doi.org/10.1089%2Ffpd.2009.0282), last accessed August 23, 2017. Myeong-Sook, J., “Effects of Aroma Massage on Home Blood Pressure, Ambulatory Blood Pressure, and Sleep Quantity in Middle-Aged Women with Hypertension,” Evidence-Based Complementary and Alternative Medicine Journal, January 30, 2013, 2013(403251): 7 pages; https://www.ncbi.nlm.nih.gov/pmc/articles/PMC3570933/, (https://dx.doi.org/10.1155%2F2013%2F403251), last accessed August 23, 2017. Haj-Husein, I., et al., “The effect of marjoram (Origanum majorana) tea on the hormonal profile of women with polycystic ovary syndrome: a randomized controlled pilot study”, Journal of Human Nutrition and Dietetics: the official journal of the British Dietetic Association, February 2016, 29(1):105-11; https://www.ncbi.nlm.nih.gov/pubmed/25662759, (https://doi.org/10.1111/jhn.12290), last accessed August 23, 2017. “19 Best Essential Oils for Sleep (Aromatherapy Oils, Blends and DIY for the Rest You Deserve),” Develop Good Habits; http://www.developgoodhabits.com/best-essential-oils-for-sleep/, last accessed August 23, 2017. Hills, J., “The Best Essential Oils For Insomnia & Better Sleep,” Healthy and Natural World; http://www.healthyandnaturalworld.com/the-best-essential-oils-for-insomnia/, last accessed August 23, 2017. “Marjoram,” Web MD; http://www.webmd.com/vitamins-supplements/ingredientmono-563-marjoram.aspx?activeingredientid=563, last accessed August 23, 2017. “22 Marjoram Essential Oil Outstanding Health Benefits,” Essential Oils Informer, February 16, 2016; http://essentialoilsinformer.com/22-marjoram-essential-oil-oustanding-health-benefits/, last accessed August 23, 2017. Sonoma Press, Essential Oils & Aromatherapy, An Introductory Guide: More Than 300 Recipes for Health, Home and Beauty (Arcas Publishing, 2014), https://books.google.co.in/books?id=k0asBwAAQBAJ&pg=PT133&dq=Marjoram+Essential+Oil&hl=en&sa=X&redir_esc=y#v=onepage&q=Marjoram%20Essential%20Oil&f=false, last accessed August 23, 2017.